The 808 bridges of Naniwa (Osaka) was so named because of its many rivers and many river crossings. Therefore, my last two blogs are about a few of the bridges that cross Osaka's rivers. The Yodogawa is about half a mile wide and it's crossed by many beautiful bridges. The Yodogawa Ohashi (see photo above) is an elegant bridge built in 1926. It carries the Hanshin Route 2 with steel girder spans for the approach and Warren truss spans in the middle of the river. It is supported on squat pier walls. Connector ramps are being built on both sides of the Hanshin (Kobe) Route 3 Bridge (see photo above). All the superstructures are steel box girders and the substructures are big pier walls. Between the Hanshin Route 2 and Route 3 Bridges is the Hanshin Mainline Railway Bridge composed of Warren Truss spans over the river. In the photo above we can see a Hanshin Express Model 8234 Electric Motorized Train (the cars have a red top and beige bottom) heading into Yodogawa Station. All the trains are instantly recognizable because of their distinctive colors. In the Google earth photo above we can see the three bridges we just studied are near the mouth of the Yodogawa. 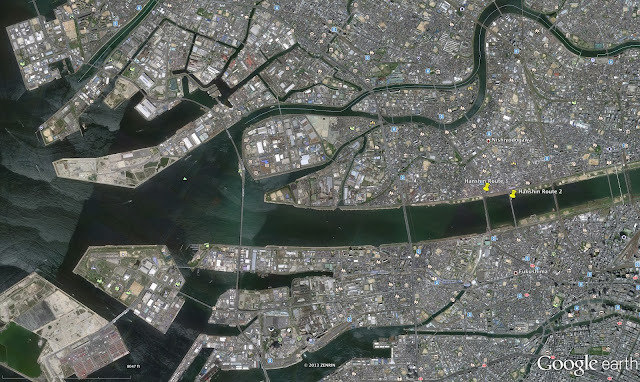 The last bridges are the Denpo and Shin Denpo Bridges and the Hanshin (Wangan) Route 5 Bridge just beyond the river's mouth in Osaka Bay with two basket-handle arches along its length. Osaka Prefecture, Japan Bridges: Yodogawa Bridges by Mark Yashinsky is licensed under a Creative Commons Attribution-NonCommercial-NoDerivs 3.0 Unported License.